As the 2006 election season approached, the governor’s top strategist, Dave Carney, invited four political scientists into Perry’s war room and asked them to impose experimental controls on any aspect of the campaign budget that they could randomize and measure. 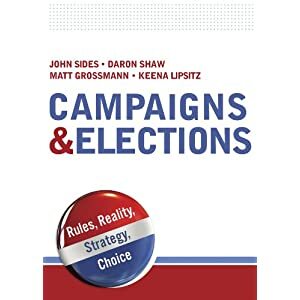 Over the course of that year, the eggheads, as they were known within the campaign, ran experiments testing the effectiveness of all the things that political consultants do reflexively and we take for granted: candidate appearances, TV ads, robocalls, direct mail. These were basically the political world’s version of randomized drug trials, which had been used by academics but never from within a large-scale partisan campaign. The findings from those 2006 tests dramatically changed how Carney prioritized the candidate’s time and the campaign’s money when Perry sought re-election again in 2010 and will inform the way he runs for president now. We report the results of the first large-scale experiment involving paid political advertising. During the opening months of a 2006 gubernatorial campaign, approximately $2 million of television and radio advertising on behalf of the incumbent candidate was deployed experimentally. In each experimental media market, the launch date and volume of television advertising were randomly assigned. In order to gauge movement in public opinion, a tracking poll conducted brief telephone interviews with approximately 1,000 registered voters each day and a brief follow-up one month after the conclusion of the television campaign. Results indicate that televised ads have strong but short-lived effects on voting preferences. The ephemeral nature of these effects is more consistent with psychological models of priming than with models of on-line processing. For more from this experiment, see this post by Kevin Collins, who finds that radio and television ads also increased campaign contributions to Perry. If Perry wins in 2012 I’ll never forgive political science. That may be extreme. But I do have some apprehension about social science being used as campaign market research. Should publicly-funded scholars pick sides? @AGH: They aren’t publicly funded if Perry’s campaign provided the money. @Adano: All I was implying was that some (Daron Shaw, in this instance) are scholars who use publicly funded goods (STATA, office space, graduate assistants, etc.) to serve the interests of a campaign. While they may enjoy additional funding from Perry’s campaign for this experiment, they still rely on resources that Perry did not provide. If Gerber, Green et al’s research isn’t used for campaign marketing purposes, what are they doing it for? There’s not a lot of theory building that emerges/goes into this behavioural research. I think if political science has a problem with this type of research, then they should just say it’s not science and not publish it in top journals. i do agree with you re: public funds. To be fair, even if Perry financed it and is benefiting from it, it was an opportunity to study something that hadn’t been studied and Perry doesn’t appear to have confiscated the results. Others can benefit from it as well. If they had studied this on their own and published it in a journal, they couldn’t have kept Perry or anyone else from benefiting from the results, nor should they. But did they establish that this poll had good predictive value for the election?